Mr Watkins claimed the annual Engineering Employers’ Federation ‘Make it Britain’ Photography Awards title with an image taken at Croft’s factory in Warrington, UK. 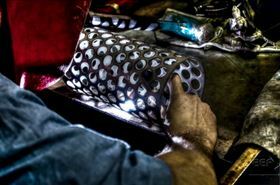 The photograph, named The Welder Returns, shows one of Croft’s engineers welding together a bespoke six millimetre thick perforated plate cylinder into a North Sea oil line filter. “While manufacturing provides plenty of opportunities for exciting images, the challenge is in capturing a photograph that turns people’s heads and makes them think again about the role and diversity of industry in Britain today,” said Mr Watkins. He was presented with a winner’s certificate for the Best Amateur Photographer and a share of £5,000 worth of Canon photography equipment at a special ceremony in the House of Commons. Manufacturer of customized filters, Croft Filters, has produced a concise look at the entire history of soldering throughout the last 9000 years.